Evoke Inner Joy with our Well-Being Mala Beads! With the holidays quickly approaching, it seems there’s no better time than the present to focus on family and living in harmony, reminding ourselves how fortunate we are to be surrounded by those we love during this special time of the year. 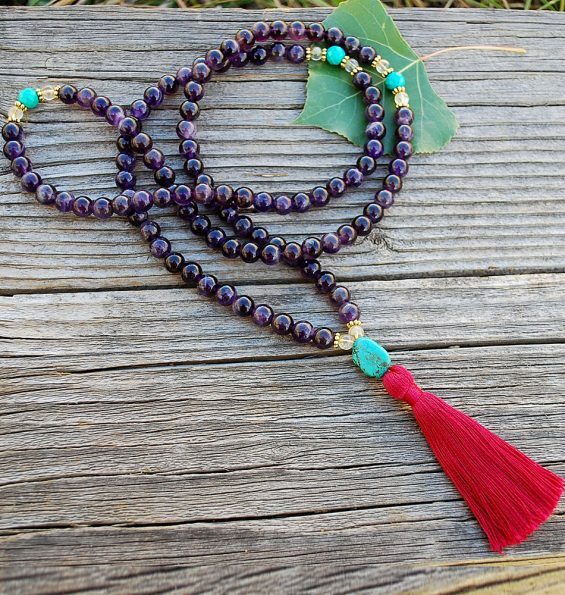 This month, we will highlight the magnificent power of the Well-Being Mala Beads. The beads are made using Amethyst, Turquoise, and Citrine. Together, these stones pave the way to unity and togetherness. Deep, and rich in color, amethyst is ever so soothing for the soul. Holding the beads in your hands you will begin to feel your crown chakra energy flow freely. Amethyst carries calming properties. It slows the hectic mind, eases the emotions, and relieves physical pain. With your body in such a relaxed state, acceptance and open communication are made easier. This Caribbean sea-colored stone will make you feel as though you’ve truly escaped to a paradise of your own. Allow the power of Turquoise to also heal aches and pains with its anti-inflammatory properties, as well as the emotional pain that may be buried deep within. Turquoise placed next to your throat chakra enhances your ability to speak effectively and resolve family conflicts. The last important piece to your healing: the Citrine stone. It’s a perfect complement to Amethyst in that it also calms the mind and emotions. Citrine chases away dark, negative thoughts, leaving you free to laugh, love, and enjoy yourself and the ones you love. We just love the Well-Being Mala beads because they’re a perfect blend of the stones you need to heal your mind, body, and spirit, connecting you to your higher self, and enabling you to live in peace with those around you. Retrieve these beads whenever you’re in need of healing, and try to form a habit of praying with them daily, as this will prevent negative energy from seeping in. If you do not own the Well-Being Mala beads, you may purchase them here and begin the journey to unleashing your truest self.